See our selection coin silver at Nelson and Nelson Antiques located in NYC, New York. 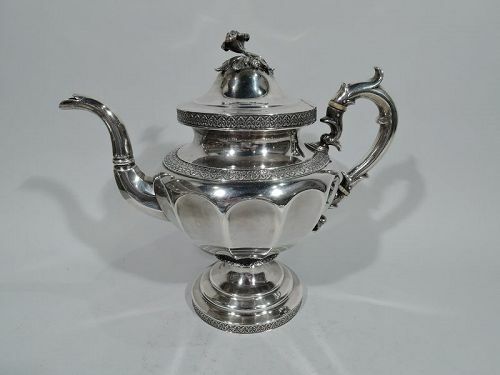 Victorian coin silver ewer. Made by Wood & Hughes (later Graff, Washbourne & Dunn) in New York, ca 1860. Helmet mouth, leaf-capped s-scroll handle, ovoid body, flange, and domed foot. Chased and engraved flowers and scrolls. Tooled and beaded borders. Scrolled frame engraved with interlaced script monogram. Pretty ornament and Classical form. Hallmarked. Good condition and patina. 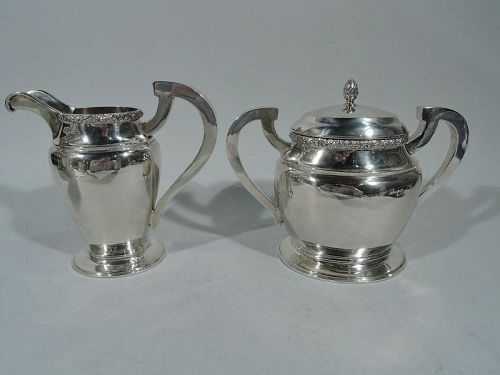 Pair of coin silver creamer and sugar. Made by Seymour Hoyt in New York, ca 1840. Creamer: Tapering ovoid body on spread foot, elongated u-spout, and wide looping scroll handle. Rim has tooled flowers. Sugar: Tapering ovoid body on spread foot, wide looping scroll handle, and raised cover with berry finial. Rim has tooled flowers. A large striking pair by a Pearl Street maker, who was active in the first half of the 19th century. Very good condition. 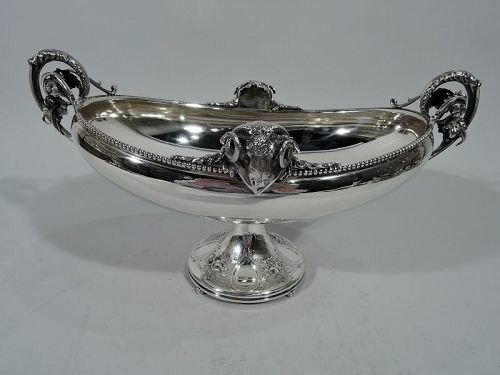 Greek Revival coin silver footed bowl. Made by Gorham in Providence, ca 1860. 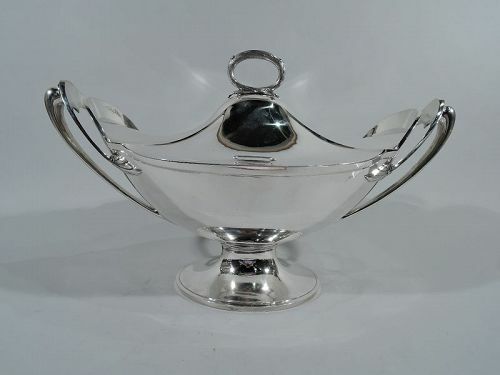 Oval bowl with foliate volute scroll end handles. Rim beaded with applied cast ram’s heads. Conical foot with beaded knop and 4 beaded disc supports. Foot has concave ovals alternating with chased flowers in trapezoidal frames. A terrific piece reflective of the midcentury Grecian vogue. Hallmark includes no. 130 and San Francisco retailer’s stamp Braverman & Levy. Fine condition. 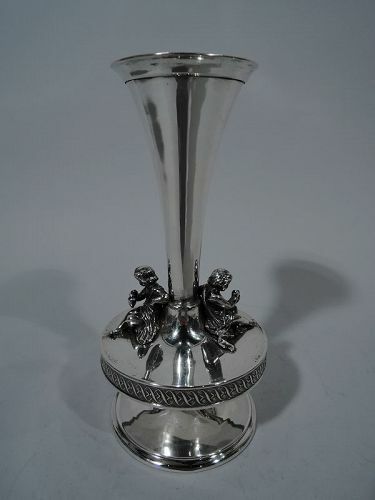 Coin silver baby cup. Made by Nicholas J Bogert in New York. Faceted baluster with capped high-looping handle and stepped foot. Lots of room for engraving. 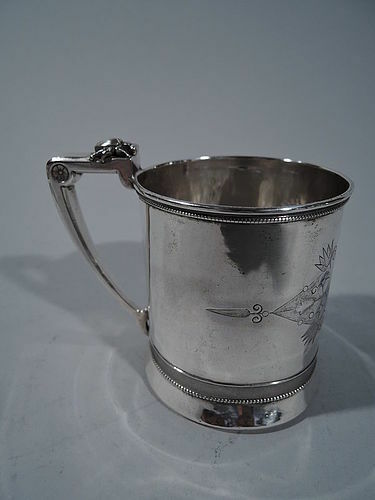 A nice piece by a historic regional maker who was active ca 1800-25. Very good condition. 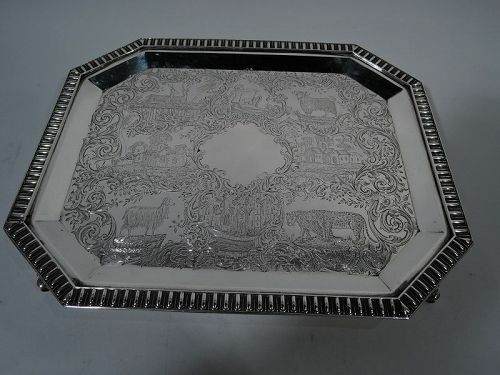 Great quality engraved coin silver salver. Retailed by Gale & Hayden in New York in 1848. Rectangular with chamfered corners. Four scrolled supports. Flat rim with bold raised egg-and-dart border. Well has central shaped cartouche (vacant) surrounded by dense decoration: A draped man with overturned vessel sits atop a medley of animals, buildings, and scrollwork. Flat rim with bold raised egg-and-dart border. Hallmark includes year. Very good condition. 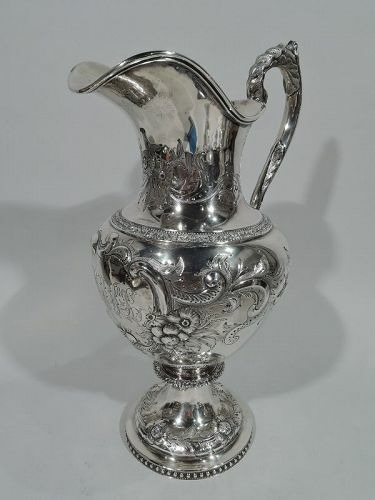 Classical coin silver vase. Made by Gorham in Providence, ca 1860. Conical with raised and spread foot. Bellied “platform” has two cast figures of seated and adroitly draped cherubs. Rinceaux band. Hallmark includes no. 610. Very good condition. 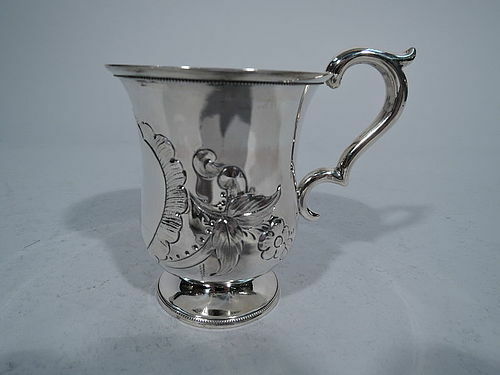 Coin silver christening mug. Made by Gorham in Providence, ca 1865. Straight sides, spread base, and scroll bracket handle with bug cap. Curvilinear frame surrounded by advanced stylized ornament. Script presentation engraved in frame. Beading and dentil. Hallmark includes no. 286. Very good condition. 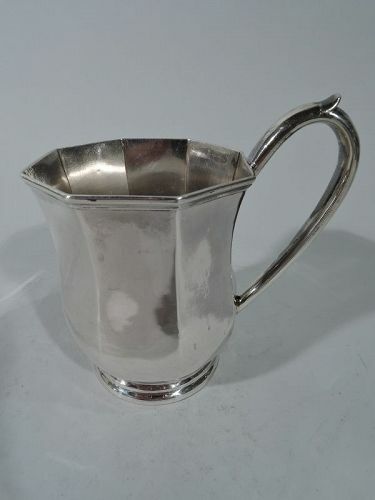 Coin silver baby cup. Made by Wood & Hughes (later Graff, Washbourne & Dunn) in New York, ca 1860. Baluster bowl with flared rim, raised foot, and double-scroll handle with leaf cap. Petal-bordered frame (vacant) with leaves and flowers. Dentil rims. Hallmarked. Nice condition and rich patina. 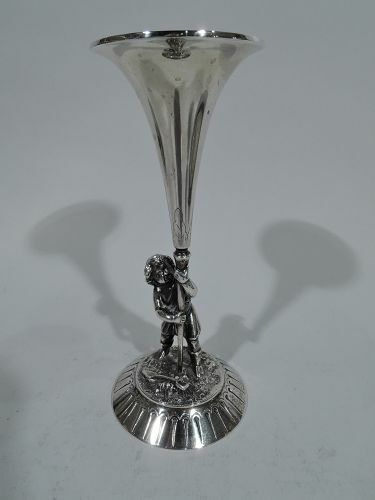 Charming coin silver bud vase. Made by Gorham in Providence, ca. 1860. Trumpet on tapering stem planted in mossy ground by boy in short tunic and boots. He holds tight with both hands. Nearby is the spade. Sweet and witty. Hallmark includes no. 750. Very good condition.